Ultra desirable Henderson area! This warm and inviting classic 50's family home sits in a prime location on the Lansdowne/Henderson slope. Almost 1700 sqft on the MAIN FLOOR! 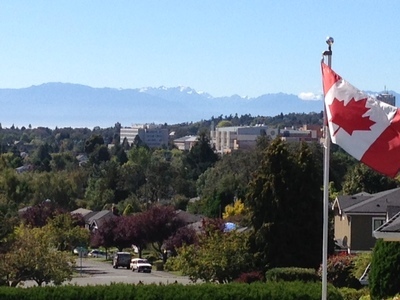 Offering PRIVACY, City, Mountain VIEWS and some ocean on clear days towards the Oak Bay Beach Hotel. The owner loved her home for 40 years. All principal rooms are of generous proportions with large picturesque windows. The dining room with French doors to a sun deck. Gorgeous oak flooring. Three fireplaces. The lower level provides a 23 x 15 family room with sliding doors to the patio and private fenced yard (could offer wheel chair access), extra bedroom and ensuite, PLUS a large unfinished area. BONUS: DOUBLE garage with ceiling height ranging from 16'-11'5. Walk to Camosun College and Uplands Golf Course. A short bus ride to The University of Victoria and downtown.